The phrase ‘off the grid’ Normally refers to a person who removes themselves from their connected lifestyle. No Internet, no mobile, no catching up and generally switching off from external contact for a period of time. My idea of hell. So it seems ironic that for 15 days I let myself get consumed, wholeheartedly by NikeGrid, to the detriment of my ‘normal’ connected lifestyle. So much so that I effectively swapped one ‘grid’ for another. It wasn’t intentional, but i wasn’t alone. From the 22nd October – 5th November there has been over 3,000 ‘gridders’. Taking on the streets of London – and each other. If NikeGrid proved anything to me, it was that us runners are a dedicated, passionate and above all honourable, (if highly competitive) breed. It also proved to me that when pushed to the limit, the human body is capable of amazing things! ‘The Grid’ is London, it’s central and surrounding postcodes, 48 in total. Each postcode had 4 phone boxes activated as check in posts, on average about half a mile apart. Find a grid phone box, dial in to start. Run to another, dial in again to log the run and score points. Repeat. As each run earns you points. The more you run, the more points you earn. Completing tasks earned special badges that award bonus points. For example, running at set times or finding hidden – ‘stealth’ phone boxes. Each postcode had a leader board. The person with the most points accumulated for that post code owns the ‘crown’. There was also a team dynamic to this. Any points a player earned got matched in the team account. Teams as well as the individuals were competing for post code crowns as well as overall points. Wether it’s a curse or an asset, I am a very competitive person. I love running and I love ‘games’. The Grid was my rabbit hole. I was like Alice in wonderland. For me Nike Grid was a game of two halfs. The 1st half, or 10 days to be precise. Was about personal targets and achievements. In this time I managed to earn the ‘Endurance 48’ badge. I became one of the small percentage of players, (runners) that can say they have completed at least 1 run in each of the 48 post codes. I had earned the ‘speed’ badge and ‘speed king’, ‘frequency’ and ‘ frequency king’ badges. These are awarded for fastest time and most runs logged in one of the 48 post codes, on multiple days. I had invested time and effort into one particular postcode and given myself a good strong point lead – I owned the ‘Crown’ for SE5. The second part of NikeGrid was all about the team effort. At the start, being in a team for me was about connecting with a handful of runners, involved in the same endurance event. I was lucky enough to join Team Audio Fuel. During the first half, individual efforts had catapulted us into 3rd place in the team rankings. We were all excelling and most of all enjoying the experience. We were a long way from the leaders – but equally, a long way from 4th place. We were all getting on, supporting and encouraging each other. By day 10 I had met a couple of the team as well as other Gridders on the streets and queuing at phone boxes. Everyone was chatty and interested in each others stories. Exchanging information and tips. There was a real community spirit. I’ll add at this point that the community spirit extended into the playing of the game. It would have been very easy for anyone to cheat, in many ways. But like a lying about a PB or taking a short cut on a route, runners just don’t do that. That’s not to say we weren’t playing phycological games with each other! I have heard several cases of intimidation tactics – I was guilty of this myself! We all wanted to win – but there was a sense of honour amongst men about it too. Everyone was playing fair which made it all the more enjoyable. Sean, Audio Fuel’s team leader, arranged for as many of the 15 strong team as possible to meet on the 10th day. The main aim was to discuss our personal goals for NikeGrid and how we could coordinate ourselves as a team to help each other and improve the overall team performance. Plans were hatched and executed. Over the next few days Audio Fuel were working the streets in packs! Pumping points into postcodes to defend crowns and take new ones. It had become very tactical and there was a lot of analysis and second guessing other teams going on. We weren’t the only team stepping up our game though – it was a battle! We were coming to the final days of NikeGrid. Players were getting tired and injured but there wasn’t time to rest. With bonus points being awarded for runs between 5am and 8am, (early runs) and 7pm and 10pm, (late runs). If you weren’t out running, someone else was! It was all about attacking and defending Crowns. I had run 15 days with just one rest day when I was working in Manchester. Each day running for 3hrs and covering 12miles, on average. Luckily it wasn’t as harsh as it sounds. Runs were punctuated with a couple of minutes rest in phone boxes to register efforts. When chasing the Endurance 48 badge, there was a lot of map reading too, (with my iPhone, of course!) which also slowed the pace. Non the less – stretching, correct fuelling, compression kit and ice baths physically enabled me to keep going. This was accompanied by the mental determination of the task in hand. There were no ‘junk miles’ in this game – each run had a fully planned purpose for a personal or team goal. I was surprised and amazed not only by what I found I was capable of – but what others were putting them self through as well! This was an endurance event that demanded commitment. Run late, run early, run when bonus points were on offer. Sleep and rest was a luxury we were depriving ourselves of, to get in the extra runs and points! For myself, NikeGrid ended a day early. I was to fly to the States, 31hrs before the game ended. By this time I had put in a massive amount of effort. I had gained an intimidating point lead in my post code. Surely no one could catch me with the time left? And I was helping secure other post codes for the team. For the final hours of NikeGrid. I was in the states. I could do nothing but watch online as my team ran – executing their final plans. The ‘game board’ was starting to eclipse, meaning post codes were shutting down. After a few text messages to some of the runners their final runs were logged, it was all over. It had been an exhausting and exciting couple of weeks. I met some amazing people and had a great time. The days following, we were all basking in the afterglow. The results were announced and the banter continued. We were reflecting on our efforts and achievements. A wide group of runners of all abilities, brought together by NikeGrid. We shared something special. We ran our city. We battled it out for Crowns. We mastered the game board. What next? I know this won’t be the last time I see or run with the people from NikeGrid. Be it in a race, training or the next NikeGrid. Personally, I feel i have learnt masses about myself – as a result of pushing myself with NikeGrid. I would also like to start planning for an ultra marathon… Its not the first time i’ve had these thoughts. But it’s always been ‘one day’ goal. I’m not saying that next Thursday I’ll hit the road for a 50miler! But I feel more capable and confident with such a challenge. I have the Brighton Marathon to focus on now. But after that I’ll be ready to start the journey to an ultra and set some goals to work towards. It might be the end of the game. But the running doesn’t stop here! This entry was posted in Uncategorized and tagged endurance, Lindon, Nike, nikegrid, run, running. Bookmark the permalink. Brilliant, totally inspiring piece. I still cannot believe you ran in every single 48 postcodes. Superb James, really you earned the badge and the honour that goes with being one of only 3000 to participate. Truly amazing. Loving the new WordPress too. Great write-up. I was so jealous seeing all the updates on Facebook. I’ll have to move back to London to do the next one. What a great write up of what seems like a great event, well done James! You are the man. Like Angela said, it was amazing that from Washington DC, you were operating the main control board, sending team members all over London to defend hard won postcodes. It was such a pleasure to have you on our team, you can crash at mine for the whole of the 2 weeks next time round. And just 9 people ran all 48 post codes. Maximum respect to you sir! Great sum up of a great competition. It was my first NikeGrid (somehow missed the first one) and loved every minute of it. Looking at the dashboard to see how runners in front and (especially) behind you were doing was an event on its own! Can’t wait for next one! Well done, James. There was no way I was going to beat your SE5 lead after that first 10 days. I just hadn’t run enough before. Still it was a great competition and I had a lot of fun. Seems like you did too. I ran all 12 in south and for me it was a personal best as I’ve run faster than I thought I could run. I did the Nike Grid earlier this year over 24 hrs and this one was much better !! 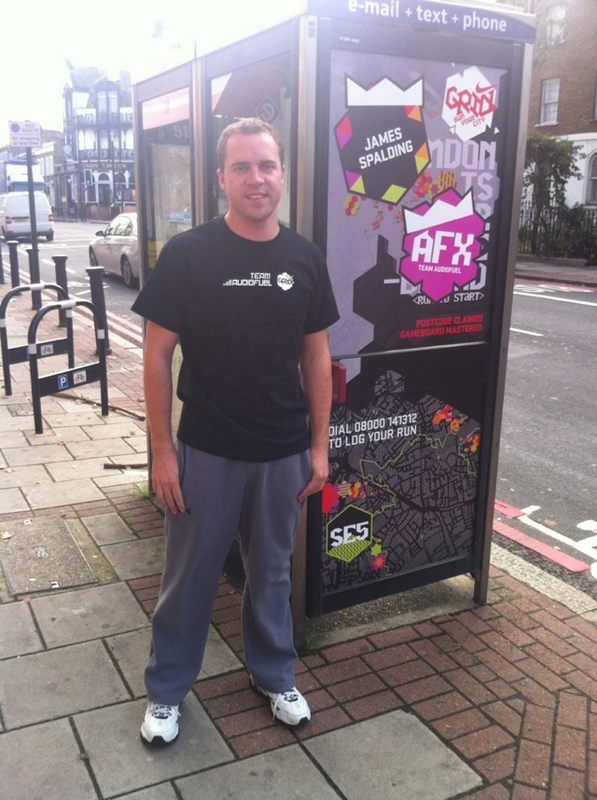 Well done for claiming SE5 and I agree it makes you want to go out and try another “large” challenge !! Like you the first week was one of personal targets, though mine were more modest: 12 postcodes not 48. That still took some planning so that you completed a run in each of them is amazing. I always run alone but having read your blog I wish that I’d accepted an invitation to join a team for Nike Grd. I never experienced the community buzz or the competitive edge that clearly came from being part of one. Next year I’ll revise my approach! Hopefully Gridette will take note of some of the Facebook chatter and a Spring run will be added. Bring it on! Thanks for posting a great review. Berlin Marathon 2011 – Been there, done that, paid extra to get the t-shirt!